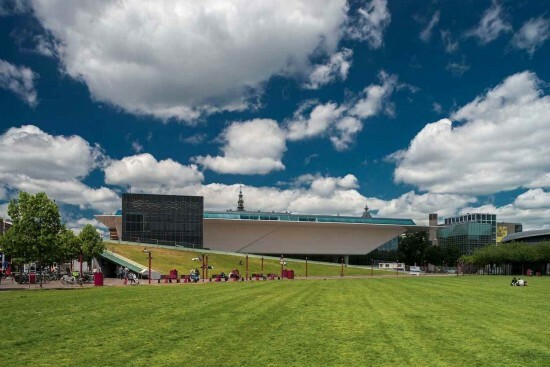 The Stedelijk Museum in Amsterdam is a museum for modern and contemporary art & design. This museum reopened in September 2012, after modernization and enlargement. Tthe Stedelijk Museum consists of more than 90.000 of modern paintings, photographs, graphics, design objects, video artifacts and sculptures. The Stedelijk Museum (or municipal museum) is an innovative and interesting, starting as a modern art museum from the 1970’s. This museum hosts modern art collections of the world from notable events from across the world such as Cubism, fauvism, the impressionists, expressionism and a unique collection of the 29 paintings of Casimir Malevich. Visitors to the museum also enjoy a very good collection of European and American trends since the 1950s with works of Matisse, Picasso, Newman and Warhol displayed. How to get to the Stedelijk Museum in Amsterdam? Getting is is quite easy. It’s located on Museum Square, next to the Vincent van Gogh Museum. Metro: There is no metro in this area. Bike: Do as the locals do; explore Amsterdam by bike. Rent a bike at one of the many bike rental companies in town.